Parents are very busy people. If they are not busy working to sustain their family’s living, they are busy doing household chores to keep their family living. Parents barely have the time to watch over their children 24/7. That said, for families with babies and young children, it is necessary to keep a baby-friendly environment at home. After all, you never know what could happen in the split second you looked away. Because it is always better safe than sorry, here are a few products that can help make your humble abode more baby-friendly. Having stair gates are important if your child is too young to climb the stairs. When selecting the material of your baby gates, go for non-accordion plastic stair gates. Wooden stair gates might cause splinters. If there is no option but to go wooden, choose those with rounded edges. Much like anything else around the house, try to stay away from sharp edges. Choose baby gates with vertical columns, as babies and young children might attempt to climb horizontal columns. The spaces in between these columns cannot be more than 5cm to avoid body parts getting stuck in between. Be wary of loose parts than can easily dismantle – these may cause falls and choking. Socket guards are known to help prevent electric shocks, especially for very curious kids who like poking and touching around. However, parents should remember that these socket guards are a potential choking hazard because of its small size. That said, it is important to choose high-quality socket guards that do not easily loosen. At the same time, family members have to be responsible enough not to misplace the plugs or leave them on places babies can reach. 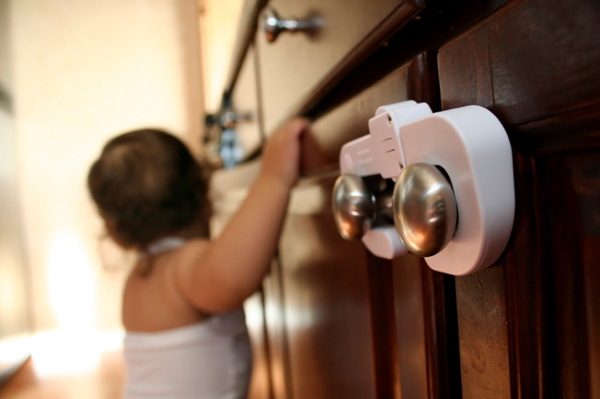 Appliance covers are often used for electric fans to prevent injuries for babies who like to poke things. Like socket guards, appliance covers can become a hazard if it is defective or of poor quality. As an alternative to appliance covers, choose an electric fan that has a built-in screen inside for added protection. Furniture guards help prevent injuries caused by bumping and other accidents. Choose protective guards that adhere strongly and fits perfectly with your furniture. Otherwise, expect your guards to easily come off and become choking hazards to your kids. In choosing furniture guards, go with those in neutral colors. Cute colors and designs tend to attract the attention of children. In choosing bath seats, select those with new and durable designs. Make sure to replace bath seats regularly because old, worn-out bath seats are very hazardous for children. In fact, there have been several incidents of drowning due to weak bath seats. Furthermore, old bath seats designs allow little children to slide underneath due to their bigger leg holes. To date, it remains a debate whether bath seats do assure safety for unsupervised children. These safety products offer parents peace of mind, above anything else. However, parents need to remember that there is no assurance that these products can keep their babies absolutely safe. To reduce the risk of danger, it is best to choose brands that are dependable, credible, and ISO-certified.